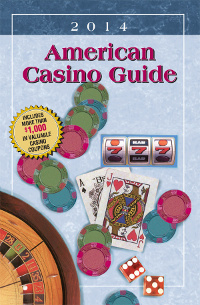 We are offering a special deal for BJI subscribers for the new 2014 American Casino Guide just in time for the holidays (makes a great gift). Only $12.95 (retail $18.95). See below for details. G2E is the premier trade show and conference event for the international gaming entertainment industry. In September, over 455 companies displayed their new products to casino executives from around the world at the 2013 G2E, and many attended a bevy of seminars over four days, dealing with all aspects of the casino business. Two BJI writers attended the G2E ... Stu D. Hoss, who attended several industry seminars, and John Grochowski, who walked the exhibit floor. Don't miss reading their reports to learn what the casino industry has planned for us in the future. Vinny DeCarlo describes a true story of the bonehead mistake a casino executive made when he ordered "cheaper dice" for his casino. KC Brooks visited the casinos in Laughlin, NV and reports on the blackjack games that he found. My good friend Kenneth Smith has revamped his blackjacktournaments.com site and his article this month summarizes the changes that he made (don't miss reading it ... the updated site has some great new features). If you want to read a heart-warming story, read Mark Gruetze's tale of how a person that was agonizing over the loss of his eyesight found relief by playing blackjack in a casino. 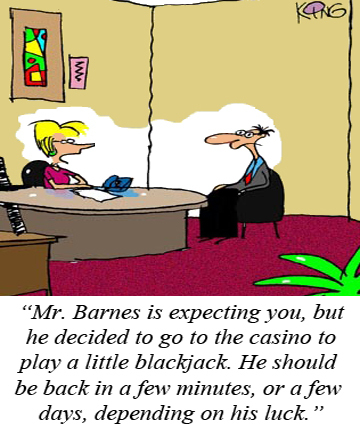 Thinking about playing blackjack full time? Better read Frank Scoblete's advice in his Atlantic City Report (and get the latest playing conditions). The new 2014 American Casino Guide book is hot off the presses. Read a summary (written by Matt Bourie) of the money-saving coupons and articles contained in the new edition. If you are baffled on how to play a difficult blackjack hand, then you need to read Henry Tamburin's article that summarizes how to play 10 difficult blackjack hands. Jerry "Stickman" presents a slam-dunk article on the strategy changes you should make if you play a short-pay Double Double Bonus video poker game (information you won't find anywhere else). Lastly, we have a summary of major blackjack tournaments courtesy of blackjacktournaments.com. We have a great collection of discounted products for casino players that make great gifts. We have strategy cards for blackjack and video poker, a DVD covering advantage strategies for blackjack, software to help master basic strategy and card counting, books on all casino games (including slots), and much more. Shop our secure online store, and let us help you eliminate the drudgery of figuring out what to buy a friend or family member this holiday season. Order now! This insider article (that appeared in BJI #99) describes how professional players Joe Pane and Johnny Chang (MIT Fame) attacked a 2-1 blackjack promotion. "Those dice have sharp edges; I don't like that. Get the other, cheaper brand. Nobody will know the difference. Read what happened when a casino boss made this bonehead move..."
"My mission this month was to head to Laughlin, Nevada to search for some playable blackjack games. Here's what I found..."
"November marks an important milestone for the BlackjackTournaments.com community. It was ten years ago in November 2003 when I launched the site. In the site's first post, I said, 'The avid casino tournament community has long needed a place like this, where we can gather to discuss our favorite pastime. I hope this message board and the accompanying site will grow to fill that need.'" "I had the good fortune to attend the Global Gaming Expo (G2E) at the Sands Expo and Convention Center in Las Vegas in late September. I hope you enjoy reading a summary of the talks that I attended as much as I enjoyed attending G2E 2013..."
"Each year I walk the display floor at the annual Global Gaming Expo in Las Vegas, seeking out game designers and distributors hawking new takes on blackjack. This is what I found..."
"Read the heart-warming story of how one person coped with a serious loss of vision by playing blackjack..."
"If you are thinking of becoming a professional gambler, read what Frank Scoblete has to say about this career..."
"Get the scoop on the money-saving coupons and information in the just released 2014 edition of the American Casino Guide..."
"Learn how to play the 10 most difficult blackjack hands correctly..."
PLAYING STRATEGY CHANGES FOR SHORT-PAY DOUBLE DOUBLE BONUS VP by Jerry "Stickman"
"This is the second in a series of articles examining the strategy changes required by various short-pay video poker games. My first article examined Jacks or Better, and this one covers the popular Double-Double Bonus poker..."